32A 5m 4 Pin Extension Lead. Australian IP56 Plug to 32A European Socket. With options of either a 4 or 5 Pin Extension Socket. 3 Phase Extension Lead 32A Australian Plug to 4 or 5 Pin 32A European Socket. 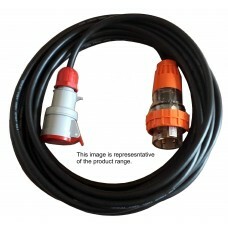 Length:..
32A 10m 4 Pin Extension Lead. Australian IP56 Plug to 32A European Socket. With options of either a 4 or 5 Pin Extension Socket. 32A 15m 4 Pin Extension Lead. Australian IP56 Plug to 32A European Socket. With options of either a 4 or 5 Pin Extension Socket. 32A 20m 4 Pin Extension Lead. Australian IP56 Plug to 32A European Socket. With options of either a 4 or 5 Pin Extension Socket. 32A 25m 4 Pin Extension Lead. Australian IP56 Plug to 32A European Socket. With options of either a 4 or 5 Pin Extension Socket. 32A 30m 4 Pin Extension Lead. Australian IP56 Plug to 32A European Socket. With options of either a 4 or 5 Pin Extension Socket.